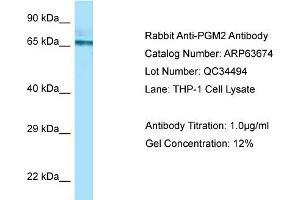 Characteristics This is a rabbit polyclonal antibody against PGM2. It was validated on Western Blot. Background PGM2 catalyzes the conversion of the nucleoside breakdown products ribose-1-phosphate and deoxyribose-1-phosphate to the corresponding 5-phosphopentoses. PGM2 may also catalyze the interconversion of glucose-1-phosphate and glucose-6-phosphate. PGM2 has low glucose 1,6-bisphosphate synthase activity.